The term “360-degree” is everywhere in marketing….36o-degree branding, 360-degree customer view. It sounds good in theory, if a bit abstract. Basically, “360” suggest circles, which brings the customer life cycle to mind. It suggests wholeness, and having a complete grasp on the customer journey. If we’re truly achieving a 360-view, we become more effective marketers. Unfortunately, the 360-degree paradigm falls short. It’s time for a better way to approach our mission, one befitting the real world challenges marketers face. Suppose you do manage to understand your customer from all sides. You’re still likely to fall short in anticipating and fulfilling their needs. Why? Think about it. Can any customer really be bound within a circle? No customer is static or two-dimensional. For many marketers, though, two dimensions is the go-to visualization, usually based around a circle or a wave that goes from product discovery to loyalty. We visualize the consumer life cycle starting with the customer as prospect and—if all goes well—it ends with the customer as a buyer. Having come full circle, it all begins again. 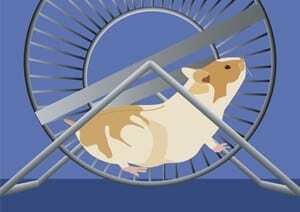 Taking a journey like this with consumers is akin to accompanying a hamster on a wheel. Sure, it’s a 360-degree wheel, but do you really want to keep that up in perpetuity? We must outgrow this circular vision. This is one instance where reinventing the wheel is a good idea. Let’s throw out the notion of circles in favor of a spiral, an upward spiral to be precise. Using a spiral to visualize and model marketing efforts lets you keep the useful parts of the 360-degree paradigm—the notion of repeating cycles, with its promise of predicting and anticipating future customer needs, and understanding customers in a holistic, non-fragmented way. Gone, though, is the static, two-dimensional approach to reading customers. Swapping the circle for a spiral lets you visualize evolution in your marketing techniques, movement that actually goes somewhere. It also demands an expanding understanding of a customer over time and a series of interactions and transactions. Customer profiles should expand with every cycle if you’re truly in a relationship. The first interaction with a customer will be the most basic one. After that, though, you’ll have gained and will keep gaining information and experience. Your relationship will evolve and become more sophisticated, cycling up through the spiral from basic grasp to an expanded, higher order understanding. This ascension never stops because you will keep evolving, continuously learning and adjusting to a dynamic, living, three-dimensional customer for whom change is a constant. Effectively using the spiral model has some requirements. You must see every interaction with a customer as a chance for insight, and never stop learning. To do this requires collecting information, measuring it, and analyzing it. In other words, before you can influence customers, you must let them influence you. Use your insights to be a good partner to your customers throughout their respective customer journeys. Insight will allow you to appropriately interact with customers at the right time and place. You will be relevant like a coat in the winter, an umbrella during spring showers, a fan in the summer, and a rake in the fall. No matter your customer’s season, you will be a good fit, the answer to a desire, the solution to a problem. Have an organization that supports evolution. Since evolving entails change, you must be able to adapt nimbly and quickly. How else could you keep up with your customer? If your marketing efforts must function within old-school bureaucratic ways of doing businesses, it’s time to reassess your methods and give new thought to your organizational structure. Be able to quickly recognize the need for an adjustment. That calls for data in real time—data that will turn into insight—ever-expanding, higher order insight. If you do these—if you travel in an upward spiral with your customers— you will reach new heights in your marketing efforts. Ben Tepfer is a product marketing manager for Adobe Campaign.